A comprehensive knowledge base of many of the Gulf of Mexico species is limited due to a variety of factors including expansive home ranges, complex environments, and species/individual differences. Much of what we know can be credited to information gathered during stranding response. The Order Cetacea is comprised of whales, dolphins, and porpoises which includes 78 different species. This group is broken up into two sub-orders, the toothed whales (Odontoceti) and the baleen whales (Mysticeti). There have been 20 toothed whale species and 1 baleen whale species identified as resident species of the Gulf of Mexico. As of 2018, the University of Florida and UF Marine Animal Rescue have responded to bottlenose dolphins, pilot whales (mass stranding), and Kogia spp. 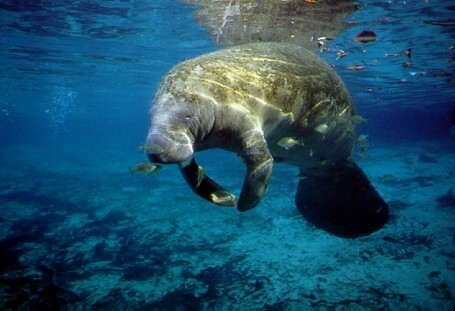 The Florida Manatee is a sub species of the West Indian Manatee and is the only species of manatee found in the Gulf of Mexico. Sea Turtles are all on the endangered species list due to the human and environmental threats like poaching and climate change in addition to natural threats. There are 7 species of sea turtles, 5 of which are found in the Gulf of Mexico: Green, Hawksbill, Kemps Ridley, Leatherback, and Loggerhead species. To learn more about these species, please visit NOAA’s protected species website for more information.